Hey everyone! How was your weekend? I had a super lazy weekend, which was a nice change. I got to do a whole bunch of swatching yesterday so now I have stuff to post for the rest of the week! Yay! 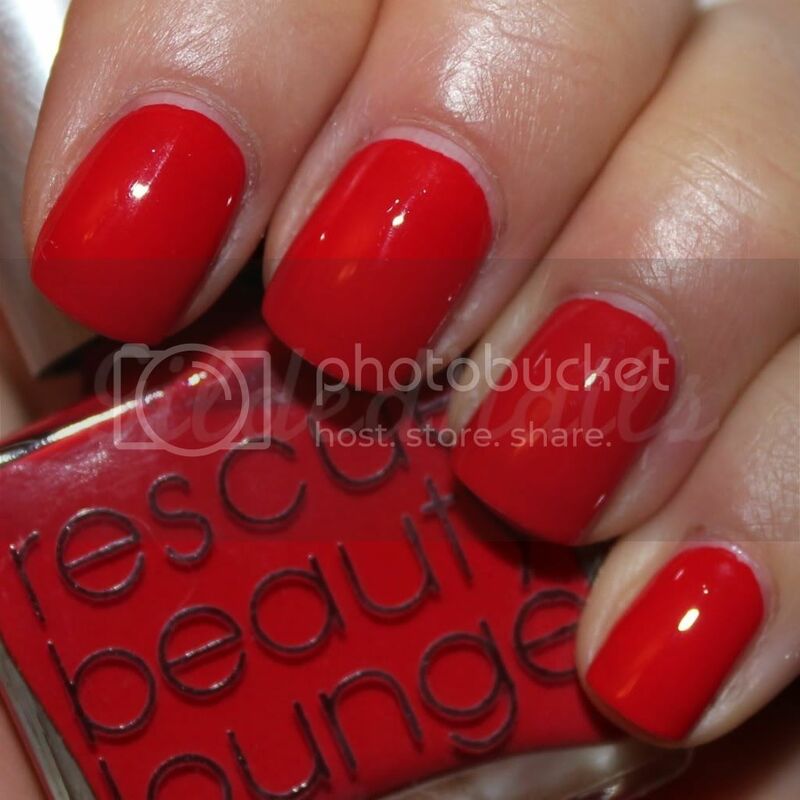 Today I'm showing you Bangin by Rescue Beauty Lounge which was from the Spring 2010 collection. Bangin is a super bright coral red cream. The formula was a little on the thin side, so I still had slight VNL after two coats, but it wasn't a deal breaker. I don't wear colours like this all that often, but this is really gorgeous! For some reason, red nails remind me of going to the nail salon with my mum as a little girl and sitting there while she had he acrylics done. I can't even remember if she wore red nail polish, but every time I wear red polish I think of that! Now you will have to excuse my cuticles in these photos. I took these pics about a week and half ago when my cuticles were ragged from the cold weather. Apart from showing you the colour, the other reason I wanted to post the pics was because I had a different nail shape in them. Should I use this nail shape again or stick with my square nails? I feel like I want a more natural shape, but I also feel like my nails and fingers look longer with square nails. I am so ridiculously undecided about it I thought I would ask you guys! 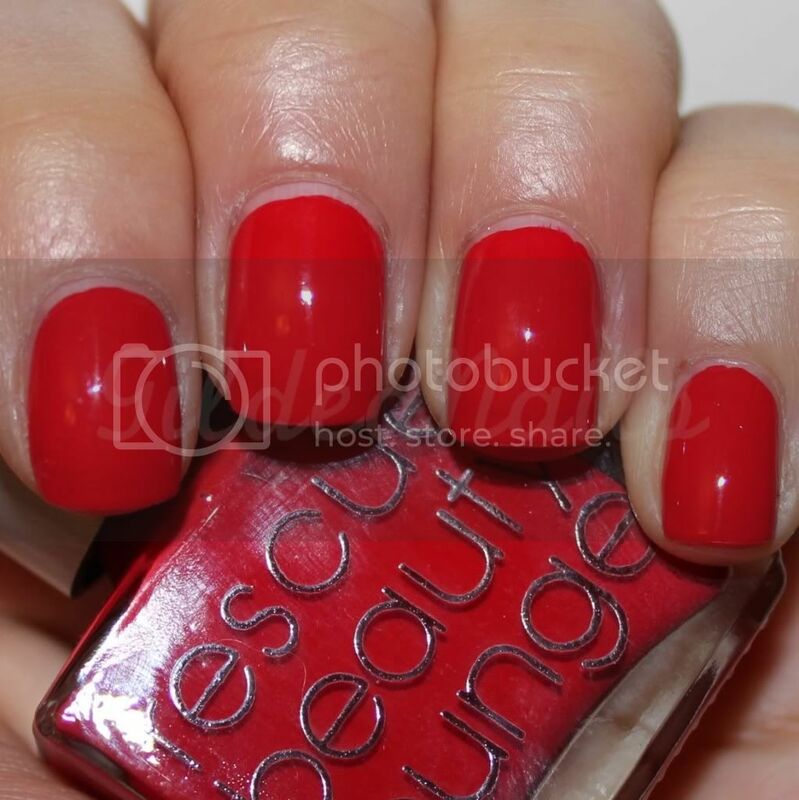 For a good example of me with square nails, check out this post. I think you might be right! The more I look at the pics, the more I like the shape! I too like this shape. It suits you nicely. I like this shape a lot better, it suits your hands and fingers much better, in my opinion. i like this shape better! the totally square ones are too drastic. Gorgeous colour. I like this new shape that you have. brand spankin' new reader here, but i like this nail shape best. and that color looks great on you!